Don’t let the Pepper Jack Bacon Burger give you the impression that these are too hot, they are NOT! But nothing some jalapeños can do if that’s what you like. These burgers are Diner style good! Even our kids can eat these tasty burgers! 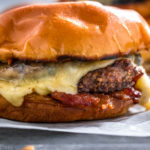 These Pepper Jack Bacon Burgers were born after an Instagram clip of someone holding up a deliciously looking pepper jack cheese, bacon, and jalapeño burger. I was lured. Most of the time I can’t seem to enjoy overly spicy foods, but some heat is tolerable and I did not find these to be spicy. 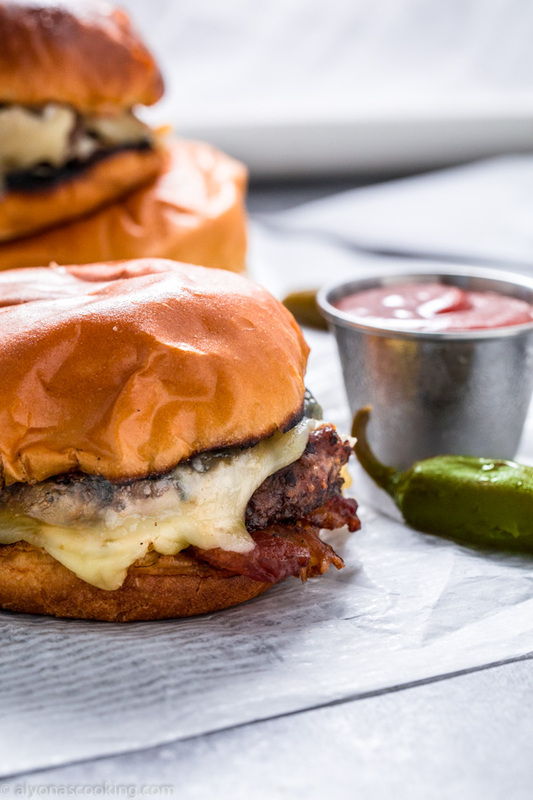 The brioche buns really bring up the quality level of this burger, making these Pepper Jack Bacon Burgers taste like a dine-in burger! 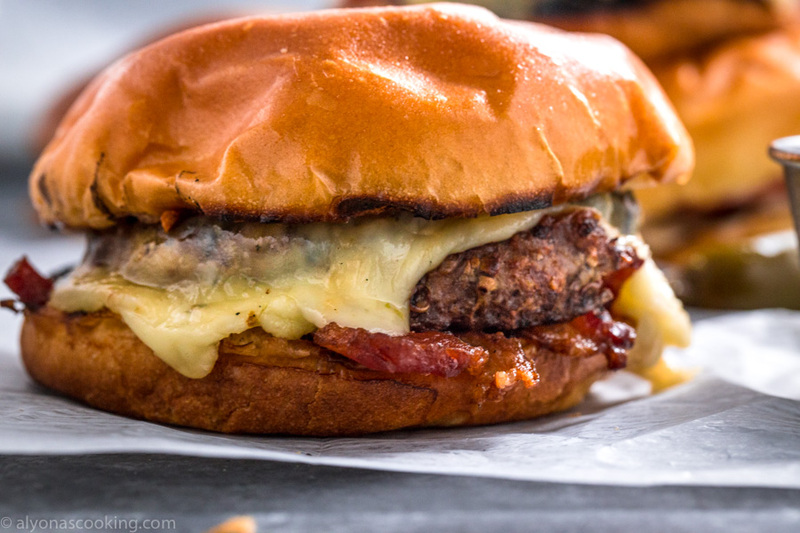 What goes in the Pepper Jack Burger? Although there are many different versions of pepper jack burgers on the web, only this version has the jalapeños in the cheese slices. No fancy sauces or stuffed meat patties — plain and simple. 1. Pre-heat grill to high heat. Once hot, quickly grill (toast) the insides of the brioche halves. Checking buns to prevent any burn marks on the bread. Remove. 2. Place beef patties on the grill and reduce the heat to medium. Grill 2 minutes on each side. Remove onto a plate and top with the cheese slices. 3. Spread a thin layer of mayo onto each bun half. Place beef patties onto the bottoms of the buns, a slice of tomato and top with the remaining bun. Don't let the name Pepper Jack Bacon Burger give you the impression that these are on fire hot, their NOT! But nothing some jalapenos can't do if that's what you like. These burgers are diner style good! Even our kids can eat these tasty burgers! Pre-heat grill to high heat. Once hot quickly grill (toast) the insides of the brioche halves. Keep checking the buns to prevent any burn marks on the bread. Remove. Place beef patties on the grill and reduce the heat to medium. Grill 2 minutes on each side. Remove onto a plate and top with the cheese slices. Spread a thin layer of mayo onto each bun half. Place beef patties onto the bottoms of the buns, a slice of tomato and top with the remaining bun.